NASA's long-lived Opportunity Mars rover has reached the site where it will wait out its sixth Red Planet winter. Opportunity — which touched down on Mars in January 2004 just after its twin, Spirit, arrived on the planet — is studying rocks at the foot of a location called Solander Point, whose north-facing slope will allow the robot to tilt its solar panels toward the sun during the coming southern Martian winter. One of those two units preserves evidence of long-ago contact with acidic water, while the other one is older and may contain minerals that formed in more neutral and benign liquid water, researchers said. 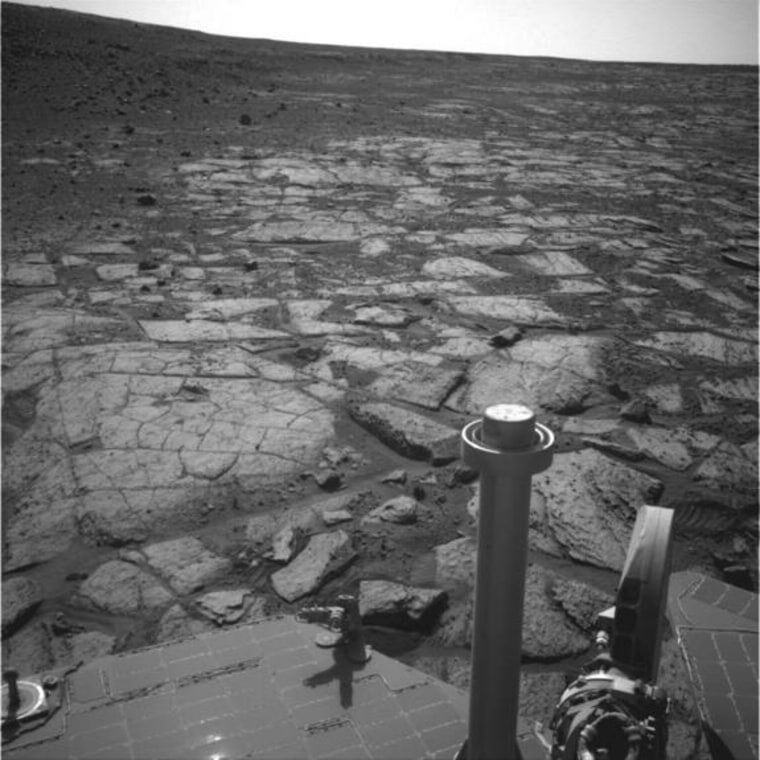 The Opportunity rover arrived at the base of Solander Point in the first few days of August, after a three-month, 1.5-mile (2.4 kilometers) journey from a spot called Cape York. Both Solander Point and Cape York sit along the rim of the 14-mile-wide (22 km) Endeavour Crater, which Opportunity reached in August 2011. The days are getting shorter in Mars' southern hemisphere, and the amount of sunlight available to the solar-powered Opportunity will reach a minimum in mid-February 2014 (the southern winter solstice occurs on Feb. 14). The rover's handlers plan to get Opportunity up onto Solander Point's north-facing slope before mid-December, NASA officials said. But the golf-cart-size robot won't hibernate through the winter; rather, it will continue to move about, investigating several different Solander Point outcrops. Opportunity and Spirit originally landed on three-month prime missions to search for signs of past water activity on the Red Planet. Both rovers found plenty of such evidence, then kept rolling along. Spirit stopped communicating with Earth in 2010 and was declared dead a year later. Opportunity has an arthritic arm and a few other age-related issues but is otherwise in good health. Opportunity is not the only rover currently working on Mars. In August 2012, NASA's 1-ton Mars rover Curiosity touched down inside Gale Crater to determine if the Red Planet could ever have supported microbial life. Curiosity has already checked off its main mission goal, finding that a site called Yellowknife Bay was indeed habitable billions of years ago. The car-size rover — which is nuclear- rather than solar-powered — is currently embarked on a months-long trek to the base of a 3.4-mile-high (5.5 km) mountain called Mount Sharp.